One import thing many new falconers overlook until an emergency arrives is finding a local vet that is willing to see birds of prey. It's not uncommon, though, for falconers to have a fairly thorough understanding their birds and a vet that is willing to work with them on prescribing medication. In the case of major trauma have a vet searched out that is available to you is important. It's important to understand that you will likely have to assist the veterinarian in the acts of casting, hooding and other falconry husbandry. 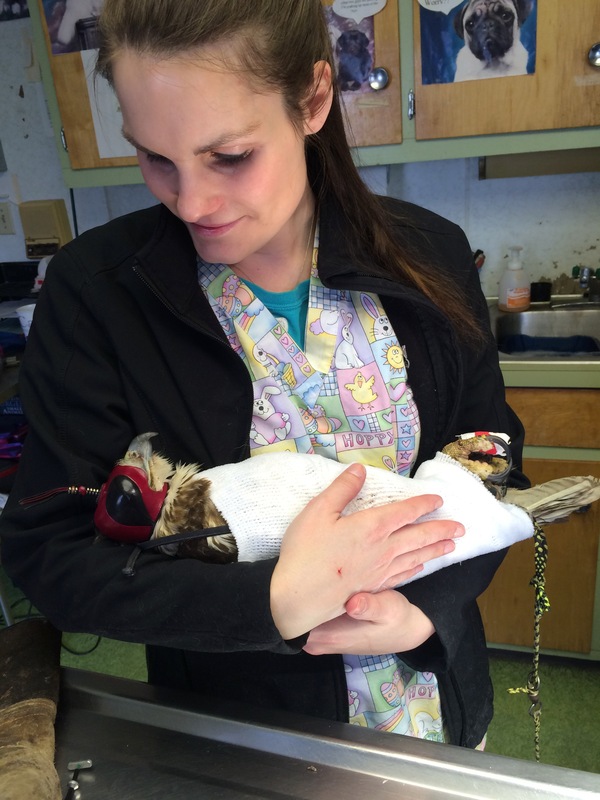 Veterinarians don't often have experience in these aspects of raptor/bird care. If you know a solid raptor vet please submit it to us via our contact page and it will get put in the data base that will get posted on this page. There is also a searchable database at Association of Avian Veterinarians. My wife, a Veterinary Technician, with a passage red tail hawk I flew that took a bad bite from a mink requiring surgery on the toe.